The recent off-campus access issues around Science Direct Sign in and redirect problems have now been resolved by the Elsevier technical team. Using either Sign in option will return a user back to the content rather than the homepage. Posted in Outage and service issues, Science Direct, Shibboleth on August 31 2017 by eSystems Team. The technical team at Elsevier are currently investigating some issues with Science Direct and off-campus access log in errors. 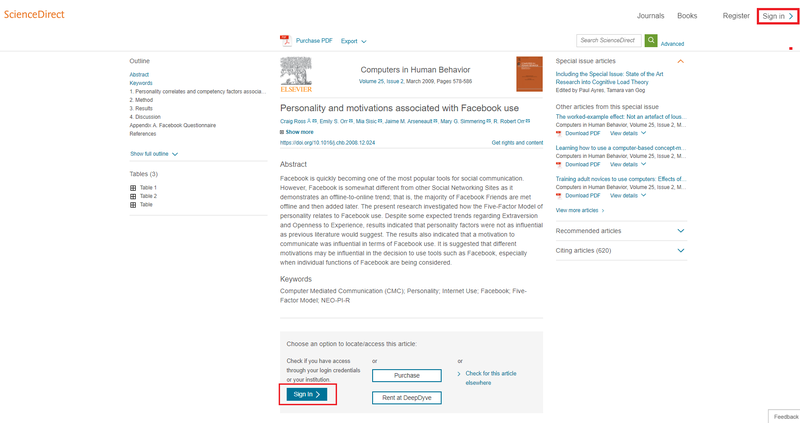 The Sign in option to the top right of the screen will return a user back to the Science Direct home page rather than the content they were trying to access. Until they resolve this issue, use the Sign in option at the bottom of the summary page of the content you are trying to access. Using this route will avoid the current authentication redirect problem. Posted in Outage and service issues, Science Direct, Shibboleth on August 11 2017 by Resource Discovery and Innovation Team Manager.